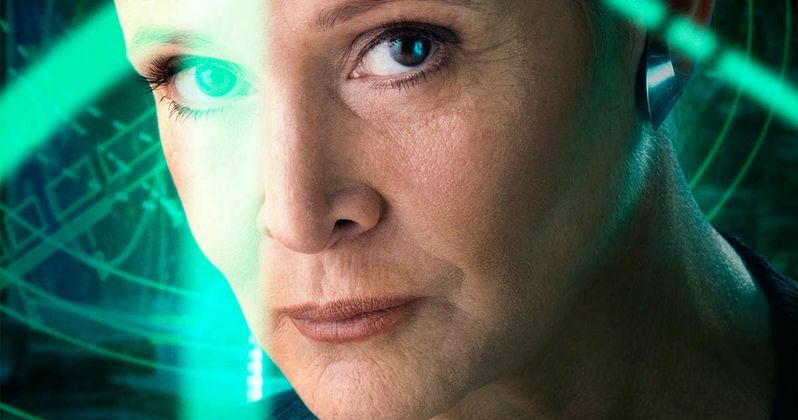 How did Princess Leia become a General in Star Wars: The Force Awakens? Why isn't she a Jedi? Where is her place in the Force? Some, if not all, of the questions you've been asking about Carrie Fisher's iconic character after seeing Star Wars: The Force Awakens will be answered in a new tie-in novel titled Star Wars: Bloodlines. The book offers Leia a whole new story, giving her a journey and adventure that is all her own. The cover for Star Wars: Bloodlines shows Darth Vader looming in the background, as Leia crosses her arms, pensive, thoughtful. Why is she sharing this latest art with her absentee father? Author Claudia Gray had this to say about the story that awaits viewers eager to learn more about the former princess turned war hero. "I find myself remembering the Episode I posters, where you see the boy Anakin with Vader's shadow stretching out behind him. In this book, we find out just how far Vader's shadow falls." Star Wars: Bloodlines will be a direct follow-up to Star Wars: Aftermath by Chuck Wendig. While that hit novel took place shortly after Star Wars: Episode VI - Return of the Jedi, this new book will take place a few years before the events seen in Star Wars: The Force Awakens. When the book kicks off, Leia is at a good place in her life, serving as a senator and leader in a peaceful New Republic. But the younger generation that is rising behind her has forgotten the lessons of the rebellion and the wrongs of the Empire. Leia begins to sense that not all is right in the universe, and that could spell danger for the future of the galaxy. The idea of family, which is a key element in all of the Star Wars movies to date, is also at the heart of this novel. One of the story's more significant events will revolve around Leia's family. Says Claudia Gray abut the drama that will unfold within her pages. "[It] has pretty far-reaching repercussions for several characters. However, this novel isn't fundamentally about Leia as a wife, sister or mom; this is about the role she's created for herself since the fall of the Empire, and the one she takes up by the time of (The Force Awakens)." Star Wars: Bloodlines will include characters introduced in Star Wars: The Force Awakens, along with other new characters that have never been mentioned before. One of the most influential new characters in the plot will be an ambitious young senator named Ransolm Casterfo. He is described as Leia's political opposite. And he is a collector of Imperial artifacts, something we heard Kylo Ren also likes to do. This guy has pro-Palpatine banners, pieces of armor and more in his own personal collection. USA Today has shared an excerpt from the upcoming book. You can read the whole thing here. In this short piece from the book, Leia is a guest at an early morning meeting where the galaxy's future will be discussed. But she soon receives a dire warning. Settling into her chair at the meeting, the future General receives a message written on a napkin. It's noted that not too many people hand-write letters anymore. The message simply states 'Run'. In an instant, Leia is on her feet, telling the rest of the committee to flee. Leia makes a break for it, but the others do not follow. She hits an alert box and overrides the emergency signal. As the sirens blare, the others come running in unison. Leia leaves the building, and trusting in her force instincts, keeps running far away, never looking back. As she runs, a brilliant light overtakes the atmosphere. A loud roar permeates her skull. And hot air and debris slams into body, knocking her out. What happens next? We'll have to wait until the book arrives on May 3rd to find out the rest of the story. The book promises to fill a lot of the holes left open by the movie. It doesn't appear that Han Solo and Chewbacca will be making an appearance, but we may learn more about their break up, and we may also learn more about their shared child Ben, who grows up to become the nefarious Kylo Ren. What do you think? Are you happy to see General Leia get a much-needed backstory leading up to the events seen in Star Wars: The Force Awakens?